Counting monarchs per square meter. Scientists aren't certain how many butterflies are in a monarch colony. For almost twenty years, their best estimate was 10 million per hectare of forest. One hectare equals 2.47 acres. What happened that caused them to raise their estimate five times higher? Here is the story. From the moment scientists saw the monarch colonies in Mexico, they have wondered how many millions of monarchs were hanging from the trees. They tried many clever ways to satisfy their curiosity without disturbing the butterflies. They counted and weighed the butterflies on a single branch, then counted the branches on the trees and made a colony-wide estimate. They tagged and released butterflies, then recaptured some, and figured out a mathematical way to estimate the total number in the colony. 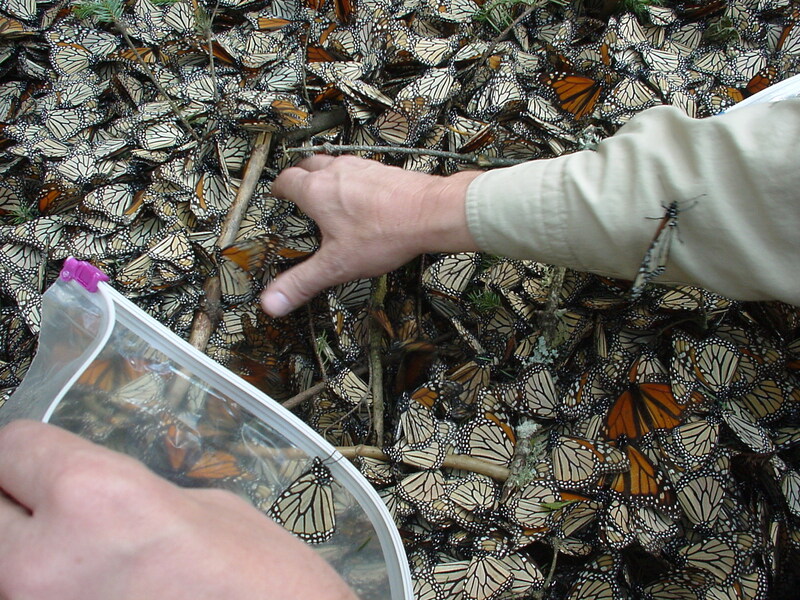 After many years, their best estimate was 10 million monarchs per hectare. 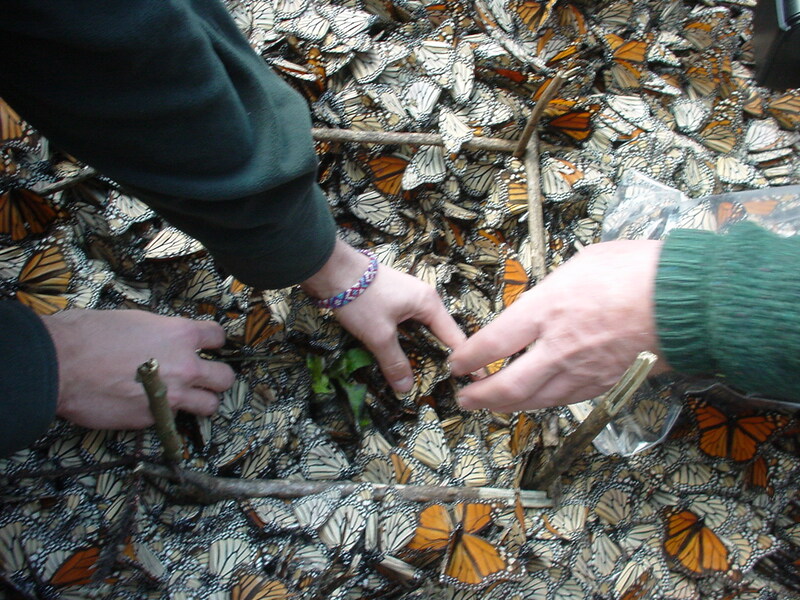 In January of 2002, a storm struck the monarch sanctuary region, killing most of the overwintering monarchs. Despite the tragic storm, it presented an opportunity to count fallen butterflies. Biologist Lincoln Brower and teacher Dave Kust were able to make a more precise estimate of monarchs per hectare. 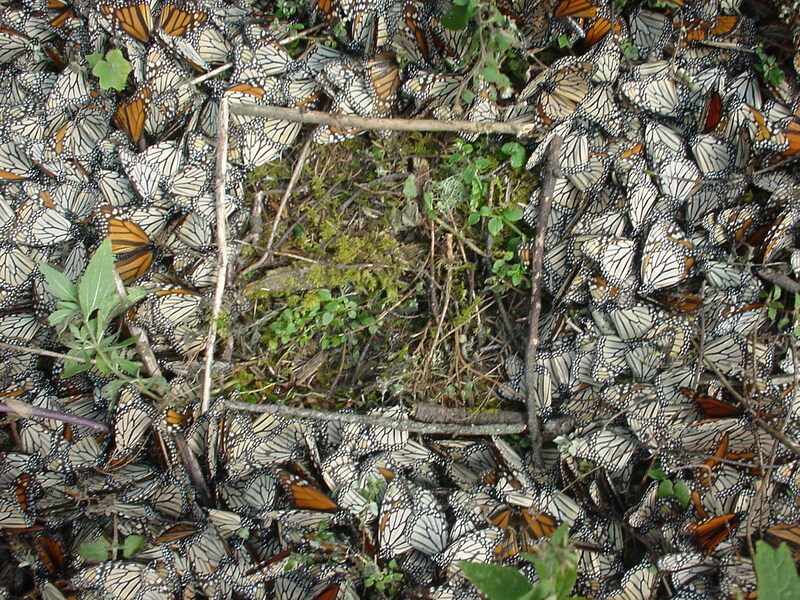 In one place, 2,241 monarchs were counted in one square meter. Dr. Brower was astonished. This would make 22.41 million monarchs per hectare, more than twice the 10 million per hectare estimate—and the count only included butterflies on the ground. Many more living butterflies still remained in the trees. Dr. Brower made counts at other sites and found an even higher number. Now scientists estimate there could be as many as 50 million monarch butterflies in a hectare.